Cute! Your plant pot gives you a Face Expression! If only plants could speak, it would be so much easier to take care of them. 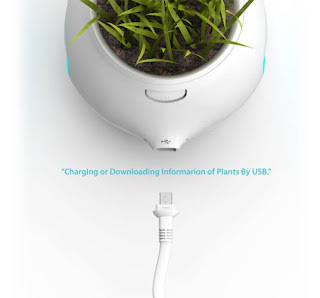 That's why I found a cute product which is amazing and named "Digital Pot" by the designer, Junyi Heo. 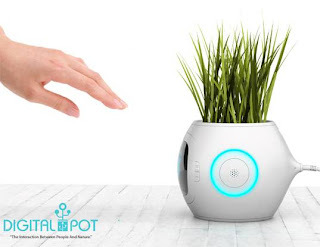 The Digital Pot were designed to relay the needs of individual plants through an interactive display of simulated plant ‘facial expressions’, this idea just might make green thumbs out of the most challenged window gardeners. They try to make the plants speak might be a bit challenging, but with such a cute face on this design.. It remind me about my project 'i-companion' - make me find what idea about how a friendly product which can make people happy and play with it? 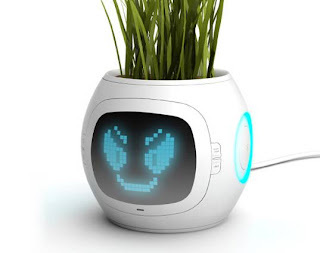 The Digital Pot can only be described as the next evolution in potted plant technology. The vessel is filled with moisture, temperature and soil sensors that can determine whether or not the plant’s basic need are being properly met. While a simple red light could’ve done the trick, Junyi went a step further and added an LCD screen to the side of the pot than lets the plant’s status be told by different facial expressions. 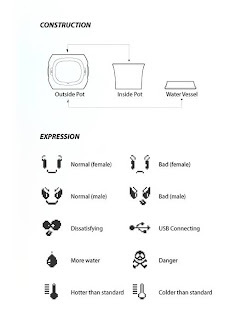 The very sleek looking pot measures soil conditions, temperature, humidity, and water - calculates those variables based on the need of said plant, and expresses its condition via a series of pictograms on an LCD Display. But, it really need to use and connect to the USB interface so it can be charged and the pertinent information can be transmitted to and from computer software as well. Just connect to your computer to download information.. So , I think that it is a better way which you can put on the desk computer. It can make you feel and like to play with it, so it will help to reduce your stress when you are working at home..